No matter where you are in your creative journey, you can always benefit from a diet that supports your fertility. Fertility isn’t just about babies, it’s about a thriving reproductive system. Even if you aren’t thinking about baby making just yet, your lady eggs still need some loving care —especially if (like me) you live in the city! Your lady eggs are delicate cells that need protection from free radicals. Unfortunately if you smoke, drink alcohol, live in the city, take prescription drugs (even birth control), or eat processed foods, you might be especially vulnerable to the damaging effects of free radicals on your eggs. A fertility diet is anti-aging, anti-inflammatory, libido reviving, and PMS protective. Who doesn’t want more of ALL the above? 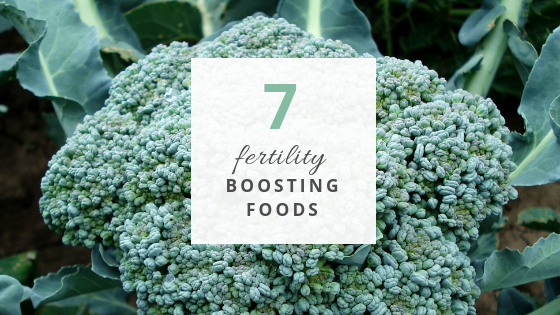 Alright lady, here’s 7 fertility boosting foods to get you started. Broccoli is rich in phytonutrients and compounds like DIM that help the body get rid of excess estrogen. Excess estrogen can disrupt a woman's ovulation cycle and decrease the chances of conception. Fatty fish like trout, herring, mackerel and sardines are a source of CoQ10 (ubiquinone). Our eggs are the largest cells in our body and they need CoQ10 to help neutralize free radicals that damage the DNA within the egg. CoQ10 supports the energy needs of maturing eggs and thus leads to better quality eggs and embryos. Research shows that as we age, we don’t produce enough CoQ10 causing eggs to fail when it comes time for fertilization. Papaya, known as the “fruit of the Angels”, is a low glycemic fruit that supports healthy insulin levels and is important for hormonal balance. It’s a great source of antioxidants like Vitamin A, Vitamin C, Vitamin E, and folic acid which are supportive of DNA integrity in our eggs. Papaya also contains the digestive enzyme papain that acts as an anti-inflammatory. Brazil nuts offer an incredible source of selenium, a mineral that helps thicken the uterine wall for implantation. Selenium also works as a mild anticoagulant that can increase blood flow to the uterus and ovaries to support conception. Selenium works as an antioxidant and prevents oxidation and DNA damage in the egg. Avocados are a rich source of monounsaturated fatty acids ideal food for boosting the health of your eggs. Avocados are also a source of B vitamins, vitamin E, folate, and potassium important for reproductive health. A study by the Harvard School of Public Health showed that a diet high in avocado and other foods high in monounsaturated fatty acids tripled the chance of success with IVF treatments. Walnuts are a great source of omega-3 essential fatty acids needed for healthy hormone production and cervical mucous production. The healthy fats in walnuts help reduce inflammation, support ovulation, and improve blood flow to the reproductive organs. Beetroots support dilation of blood vessels allowing a rich supply of oxygenated blood flow to the uterus and ovaries. An increase in blood circulation to the uterus and ovaries is important for implantation and healthy menstrual blood flow. Beets also contain high levels of iron important for the development of healthy red blood cells. There you have it! These are just a few fertility boosting foods. Of course, a complete fertility diet requires a little more planning and personalized support. Are you struggling with any menstrual related issues? Are you thinking about having a baby in the near future? Don’t be shy to reach out, I’m here to support you, lady!